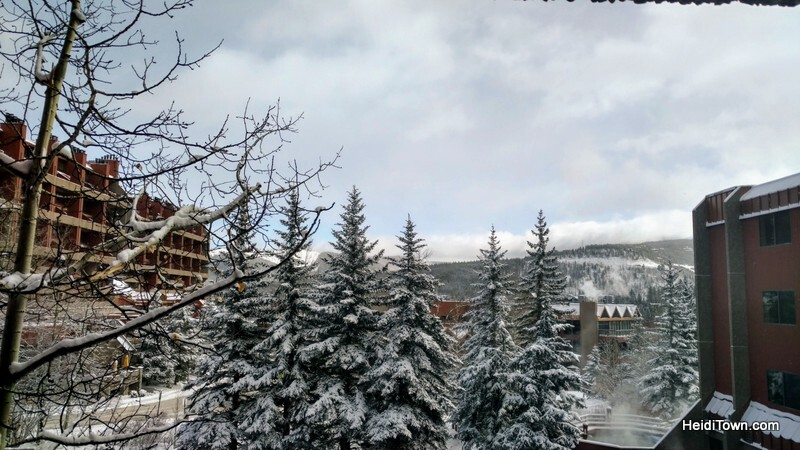 There’s no better mountain party town than Breckenridge, Colorado. This past visit was my umpteenth trip to Breck to cover a festival, so take it from me, it’s the best. 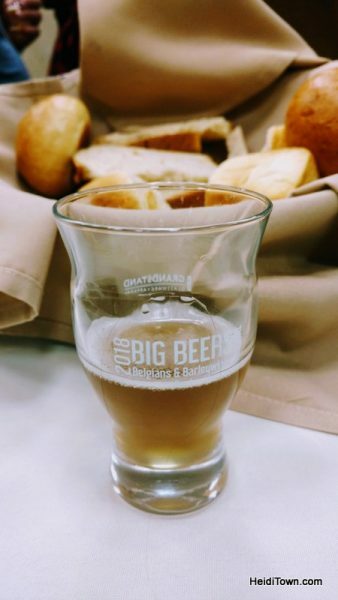 It’s a good idea to serve bread at an event where all beer must be 7% abv or higher. While Breckenridge is a great town year round, when this Victorian village is covered with a fresh layer of snow, there’s just no sweeter spot on earth. The town does get busy, and this past weekend was no exception, but it still retains that small town charm even when it’s buzzing with tourists. I took this photo a few years ago. 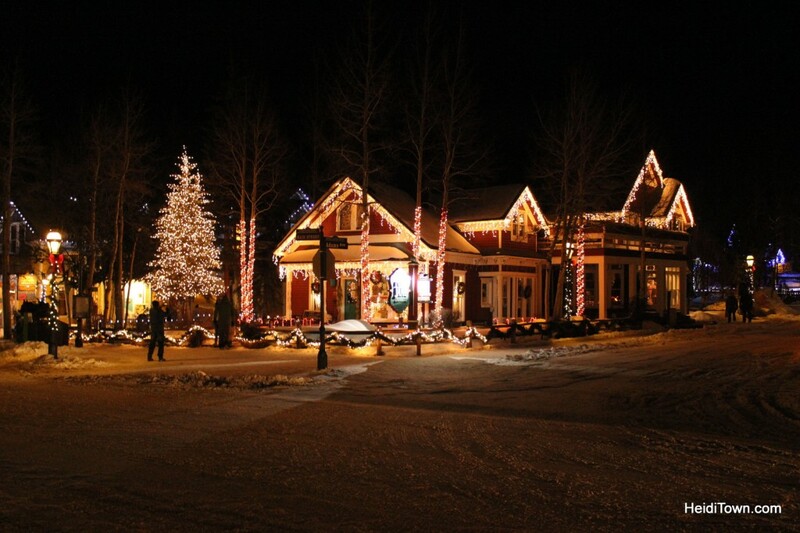 It’s a sweet little shot of this great Colorado winter town. 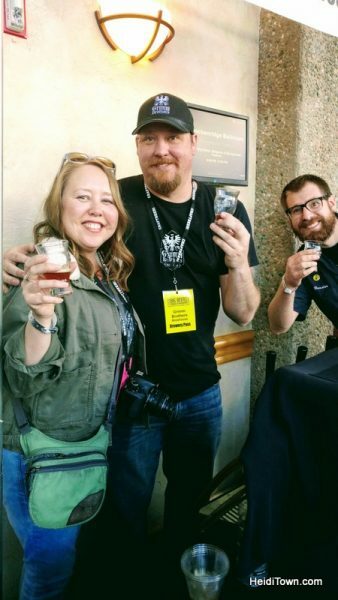 We made a quick trip to Breckenridge this past weekend to attend, for the first time, Big Beers, Belgians and Barleywines at Beaver Run Resort & Conference Center. The event has been on my radar for some time as it is wildly popular with brewers and if a brewer likes a beer fest, you know it has to be good. Hanging with one of the owners of Grimm Brothers Brewhouse in Loveland, Aaron Heaton. Big Beers is one-of-a-kind and unlike a lot of other festivals, it tends to attract a lot of craft beer connoisseurs and home brewers. This means that the intellectual beer talk is at an all-time high here, from the seminars, which start on Thursday, right through the Commercial Tasting event on Saturday afternoon. It’s truly is all about the beer at Big Beers. 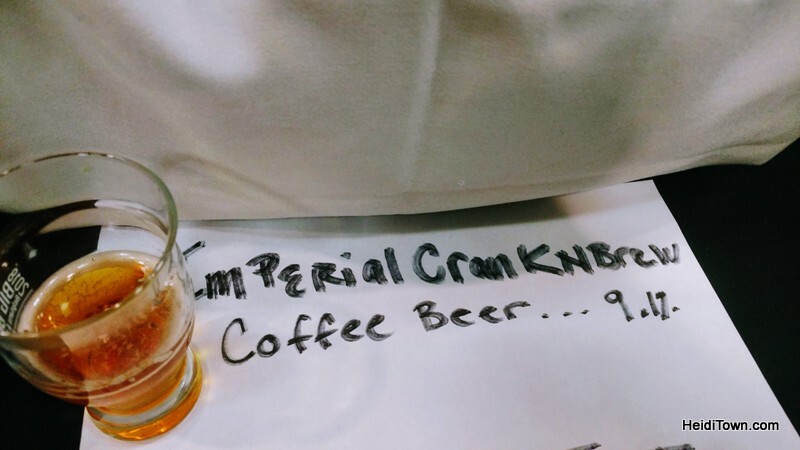 They may not have had fancy signs, but this beer from Snowbank Brewing in Fort Collins was one of my favorites. If that sounds like a festival for your, book your room well ahead of time because it’s popular. We were lucky enough to stay at Beaver Run Resort & Conference Center. This is where Big Beers is held so it’s the ideal location. I’ve been staying at Beaver Run for a number of years and on this most recent stay, we were in one of the remodeled Colorado Suites, now called Summit Suites. The view from our Summit Suite in Building 4 at Beaver Run Resort & Conference Center. We were very impressed with the upgrades. I especially loved the comfy platform bed. I loved the pillows, but I promise I didn’t steal them (and you shouldn’t either!). The Summit Suites are bright and airy and include a bedroom, large bathroom, full kitchen, plus living and dining areas. There was a real wood burning fireplace, which is rare in Colorado, but we were so busy we never used it. Beaver Run is an ideal place to stay in Breckenridge for many reasons, but perhaps the number one reason during the winter is that it is a ski in/ski out property. The resort sits at the base of Peak 9, right next to ski school. In addition, Beaver Run features restaurants, bars, multiple pools and hot tubs and lots of other amenities. Although, I do encourage you to leave the resort occasionally because there is a lot to explore in Breckenridge. 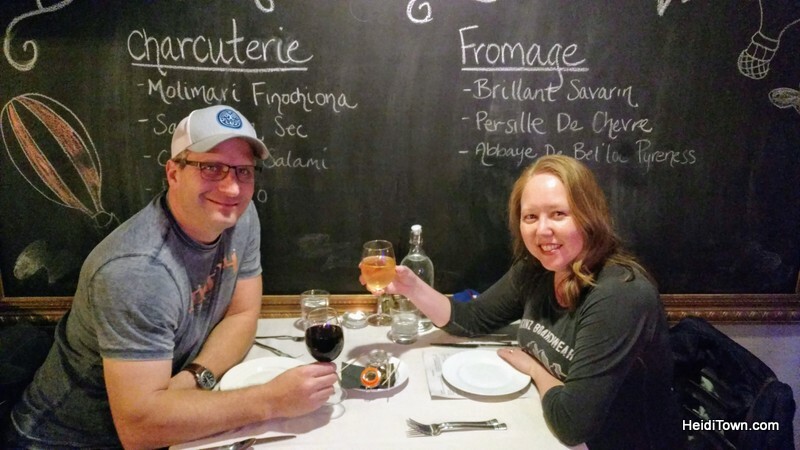 Breckenridge has long been known as a steak, burgers and pizza town, but recently, a handful of restaurants offering an array of international cuisine have opened. 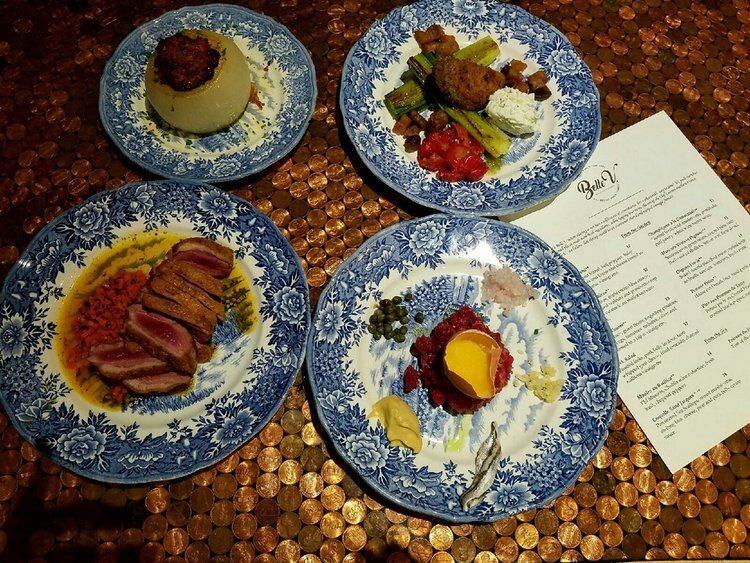 On this trip, we decided to treat ourselves to French food at Belle V. Opened by locals last winter, the “Summit Daily” reported that the Ohayon family wanted to take away any stereotypes that come with French food. They wanted to create an inviting space where anyone could stop in for an amazing bite of French cuisine. Read the entire article at SummitDaily.com. After our experience in this snug and charming restaurant, I believe they’d done just that. The restaurant has a bit of Paris meets Colorado mountain town milieu. 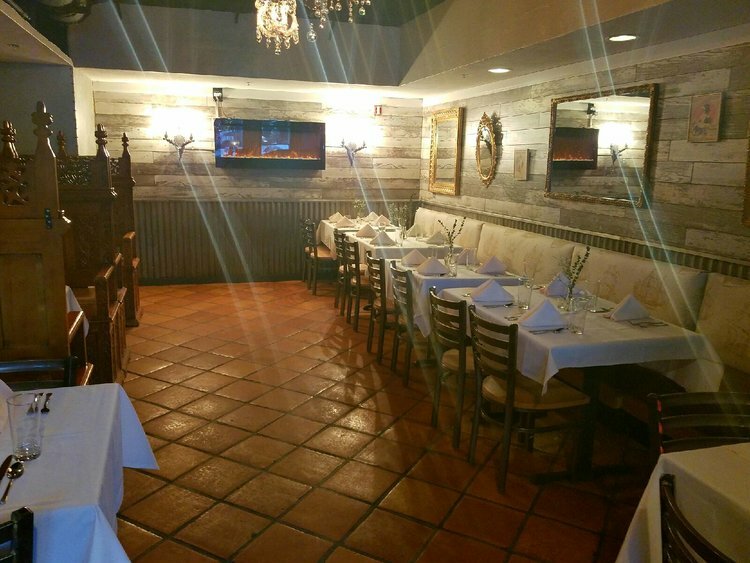 There’s warm dark wood, sparkling chandeliers and a modern wall mounted fireplace in the dining room. We started with a freshly made baguette and escargot. These snails aren’t served in a shell but rather in a glass jar with asiago cheese sauce and tomatoes. They were tasty little bites of earthy goodness and I mopped up all the cheese with my bread which wasn’t very lady-like, but I wasn’t going to waste a drop of it. We also had the soup of the day which was a shrimp bisque with enormous pieces of lobster floating on the top like a beautiful seafood painting. This was Ryan’s favorite dish on the night because the man loves bisque. The Cotes de Porc et Champignon was the pièce de résistance. This was a dry aged pork chop with fresh wild mushrooms and triple brie in a mustard cream sauce. Ooh la la was it good. Our dinner ended with two scoops of salted caramel gelato and a scoop of vanilla bean gelato for good measure. It was a delightful meal and I’m so glad we decided to stop. The dishes here are served tapas style with no sides, but ordering four plates, plus a dessert, was perfect for two people who like to eat. 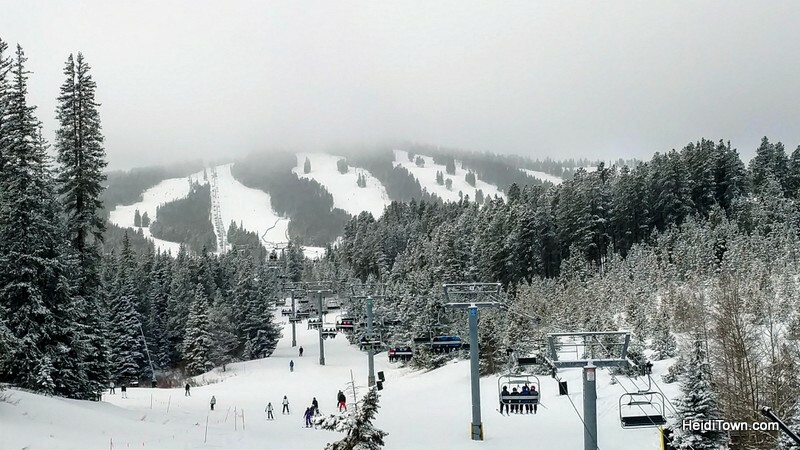 Whether you’re heading to Breckenridge for Ullr Fest this week or some skiing later this winter, keep Beaver Run Resort and Belle V. top of mind. You won’t be disappointed in either. Thank you to Beaver Run Resort & Conference for hosting us in the beautiful Summit Suite.